In today’s product review, we look at a puzzly game all about telling stories. Many games are about grand adventures, but only Stuff and Nonsense is about pretending to go on grand adventures to scam your fellow would-be adventurers. Can you sneak around London and gather the props you need for your impressive lie, all while avoiding the fiendishly clever Professor Elemental? Stuff and Nonsense is a game of position, strategy, and opportunity. 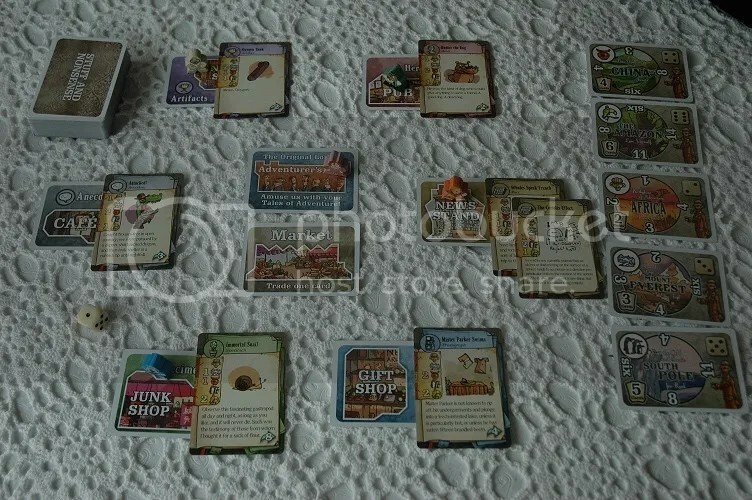 You travel around the game board — made of map cards — visiting various spots and picking up cards that will help you tell your fictional tale of derring-do. When you’ve collected the right cards — or enough to sell your fake story — you head to the Adventurer’s Club to tell your story. Each time you do so, you can cash in those cards for points. Point values can range wildly depending on the cards you have and the value of your setting at a given time. 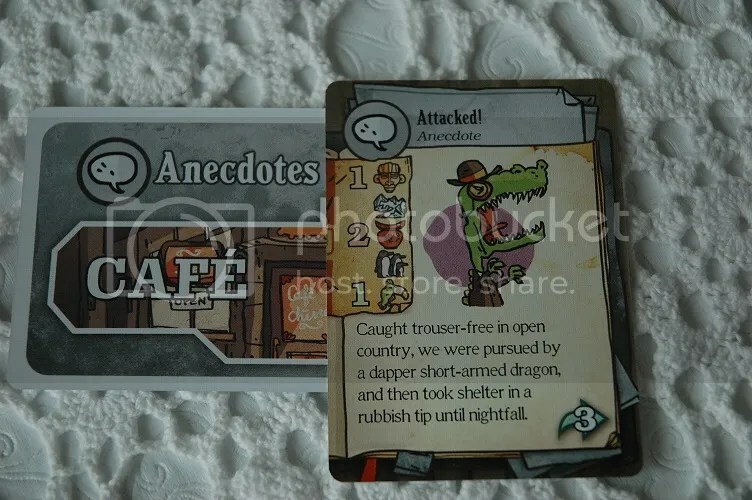 The cards are silly, creatively imagined, and often hilarious, discussing mythical events, explaining weird artifacts, and offering much-needed color to help sell your false tale. What makes this game such a puzzly treat is the mix of strategy and opportunity. You can take whatever cards you get and hit the Adventurer’s Club frequently to rack up smaller amounts of points more frequently, or you can bide your time and then hit the club less often for higher point values. But either way, there’s always the looming threat of crossing paths with the Professor at a bad time and losing a key card or crucial points. Plus, the map is different every game based on how you lay it out, so there’s a lot of replay value here. 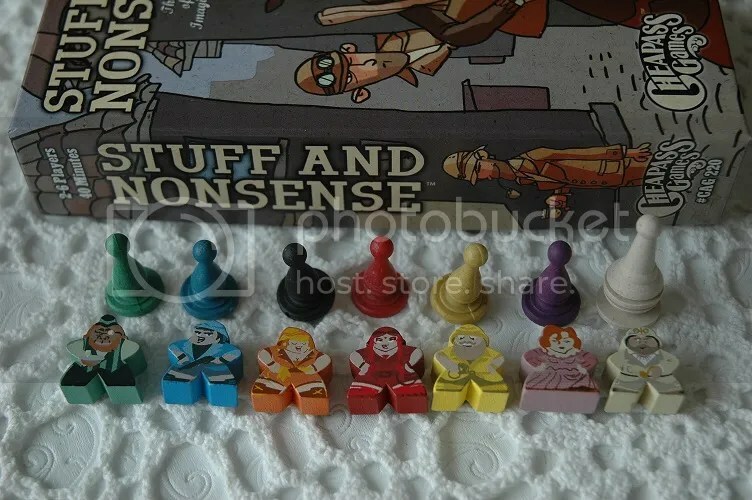 Stuff and Nonsense is available from Cheapass Games for $25, and is featured in our Holiday Puzzly Gift Guide! What great fun. This entry was posted in Games, PuzzleNation, Puzzles and tagged A Chorus Line, card game, Cheapass Games, games, Geeking Out, Gift Guide, Holiday Gift Guide, Holiday Puzzly Gift Guide, Kickstarter, opportunity, Pop culture, product review, Professor Elemental, PuzzleNation, Puzzlin' fool, Puzzly Gift Guide, strategy, Stuff and Nonsense by gmdirect. Bookmark the permalink.